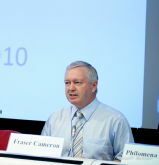 Fraser Cameron is Director of the EU-Russia Centre and Director ad interim of the new Institute for Europe-North Africa. He is also Director of EuroFocus-Brussels, a Senior Advisor at the European Policy Centre (EPC), and an adjunct professor at the Hertie School of Governance in Berlin. Born in Scotland, Dr Cameron was educated at the University of St Andrews where he received an honours degree, Master of Arts, in Political Science and History (1970). He then obtained a PhD in International Relations from the University of Cambridge (1973). He was a Research Fellow at the University of Hamburg (1973-74) and a Lecturer in Modern History at the University of Kent (1974-75). From 1975‑89, he was a member of the British Diplomatic Service. Dr Cameron joined the European Commission in 1990 and was closely involved in policy issues related to the external relations of the EU. From 1999 to 2001, he was the Political Counsellor in the EU Delegation in Washington DC. As an adviser in DG Relex he has worked on issues such as global governance, transatlantic relations, Asia, CFSP, arms control and enlargement. He joined the EPC on secondment from the Commission on 1 September 2002 and retired from the Commission on I January 2006. Dr Cameron has lectured widely in all continents and is a well-known media commentator. He is an advisor to the BBC and to the UK government’s Higher Education Panel on Europe. Dr Cameron is the author of numerous books and articles on European affairs.